Radio facilities, particularly mountain top transmitter sites, are prone to power transients. The causes can be varied, but most often, lightning is the culprit. Long power transmission lines to the site are vulnerable to direct strikes and EMF induced spikes from nearby strikes. Other issues, such as switching transients, load fluctuations, and malfunctioning equipment can lead “clear weather” outages. Of course, the best way to deal with such things is prevention. 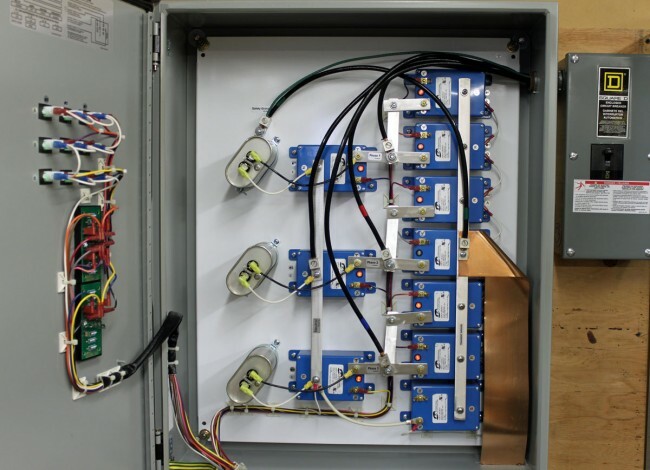 This is an LEA three phase 208 volt shunt surge suppression unit, which has MOVs between all phases to ground and each other. That is connected in parallel to the electrical service with the circuit breaker disconnect. These function well enough, provided there is a good bit of series inductance before the unit and also, preferably after. The series inductance can come from many sources, including long secondary leads from the utility company transformer or electrical conductors enclosed in metal conduit, particularly rigid (verses EMT, or FMC) metal conduit. The inductance adds a bit of resistance to the transient voltages, which come in higher than 50 or 60 Hz AC waveform. A few things to note; MOVs have a short circuit failure mode and must be fused to protect the incoming line from shorts to ground. MOVs also deteriorate with age, the more they fire, the lower the breakdown voltage becomes. Eventually, the will begin to conduct current at all times and heat up, thus they should also be thermally fused. MOVs that are not properly protected from over current or over temperature conditions have the alarming capacity to explode and/or catch on fire. From experience, this is something to be avoided. Matched MOVs can be paralleled to increase current handling capacity. The inductor is in the 100 µH range, which adds almost no inductive reactance at 60 Hz. However, it becomes more resistive as the frequency goes up. Most transients, especially lightning, happen at many times the 60 Hz fundamental frequency used in power distribution (50 Hz elsewhere unless airborne, then it may be 400 Hz). Capacitors are in the 1-10 mF range and rated for 1 KV or greater as a safety factor. 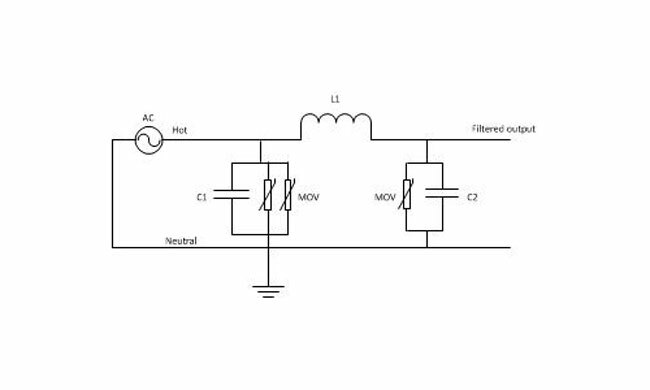 The net effect of adding capacitance is to create a low pass filter. Hypothetically speaking, of course, playing around with the capacitance values may net a better lowpass filter. For example, at 100 uH and 5 mF, the cutoff frequency is 225 Hz, or below the fourth harmonic. Care must be taken not to affect or distort the 60 Hz wave form or all sorts of bad things will happen, especially to switching power supplies. These units also need have a bypass method installed. If one of the MOV modules needs to be replaced, power to the unit has to be secured. 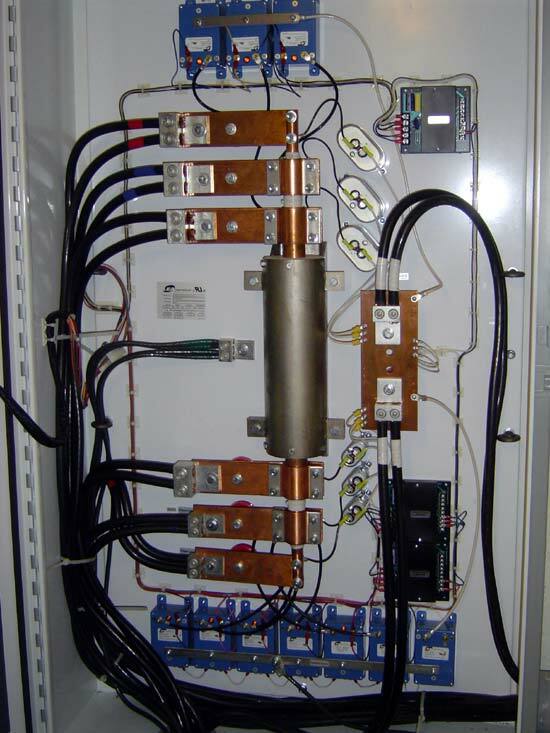 This can be done by connecting it to the AC mains before any generator transfer switch. That way, the main power can be secured and the site can run on generator power while the maintenance on the surge suppression unit is taking place.